Nearly 60% of LabourList readers think Jeremy Corbyn is the best Labour leader of the last ten years, a recent survey has found. 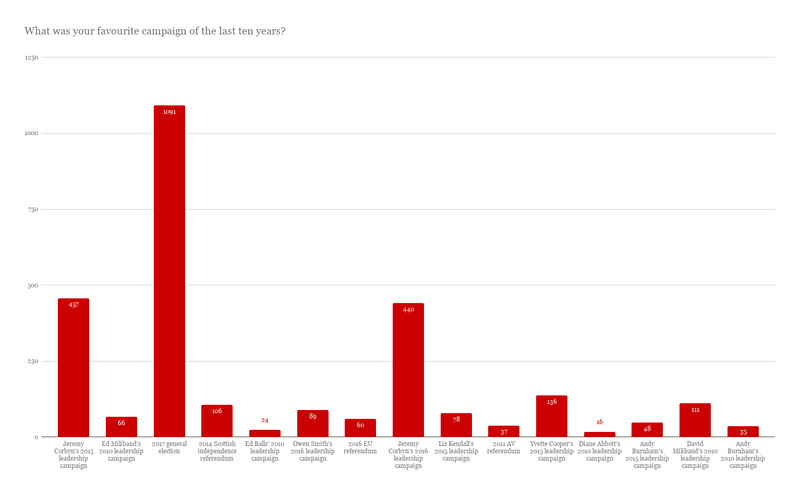 Responding to a poll celebrating LabourList’s tenth anniversary, 2,885 readers gave their views on Labour leaders, events and campaigns since the website’s launch in January 2009. 59.5% of all those surveyed believed Corbyn to be the best leader of the last ten years, while almost 30% preferred Gordon Brown and only 10.6% opted for the incumbent’s predecessor, Ed Miliband. 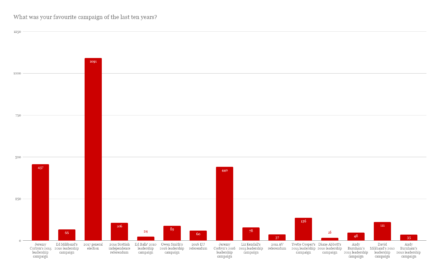 The LabourList poll also found a majority of readers favoured the 2017 general election over other campaigns held since 2009, with Corbyn’s 2015 and 2016 leadership campaigns taking second and third place in their ranking. The outcome of the snap election in 2017, which saw Labour win 40% of the vote, came third in the poll on Labour Party events, as Corbyn’s leadership election victories topped the list. 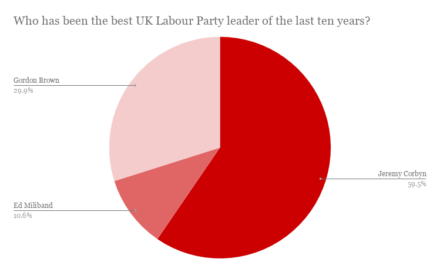 Who has been the best UK Labour Party leader of the last ten years? What has been your favourite Labour Party event of the last ten years? What was your favourite campaign of the last ten years? Thank you to all 2,885 readers who took part in our anniversary survey.